Small grains have long played an important role in Maine agriculture, and their value is increasing with new markets for a greater variety of grains, pulses, and oilseeds. 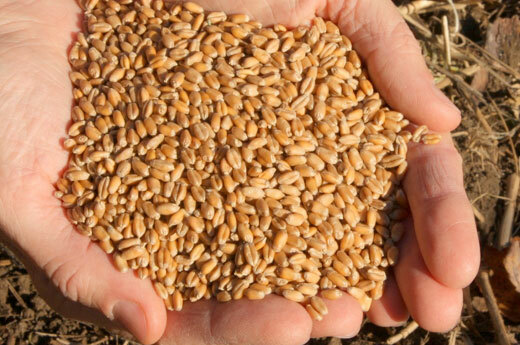 Here you will find information on growing these field crops for feed, food, and energy. Our Fact Sheets, Videos, and Research Reports provide information on growing small grains, pulses and oilseeds, including variety selection, seeding methods, weed and disease management, fertility management, grain quality requirements for specific markets, and crop enterprise budgets. As well, see videos of local grain economies in Denmark and Quebec. Our Maine Grain Conference is held annually in late winter and features topics related to production, processing, and local use of food and feed grains, with expert speakers from around the region. Recordings of talks from the 2018 conference that had to be cancelled can be found by clicking the above “Fact Sheets, Videos, and Research Reports” link. Check back in early 2019 for information about the 2019 Maine Grain Conference. Our Soil and Agronomy Workshop is held in early winter and also features speakers from around the region. The Northeast (U.S.) and Eastern (Canada) Organic Grain Network, NEEOGRAIN, was established in 2017 in collaboration with the Atlantic Canadian Organic Regional Network to increase communication among commercial organic grain farmers, buyers, and advisors in our broad region. If you are interested in signing up for the NEEOGRAIN email forum (“listserv”), send an email to Ellen Mallory at ellen.mallory@maine.edu. NEEOGRAIN Virtual Crop Hour webinars were initiated in 2018. Video recordings of the first two are available and posted under “Soil and Fertility Management” on the Fact Sheets, Videos, and Research Reports webpage. Sign up for the NEEOGRAIN listserv to receive announcements for upcoming webinars. Finally, past issues of the Maine Grain and Oilseed Newsletter, which ran from 2013 to 2016, are available by clicking on the link here or above. The newsletter provided production and research information to Maine’s grain, pulse, and oilseed producers. Information included tips on production, fertility, marketing, pest management, and more.